Turn on a cable news show or pick up any news magazine, and you get the impression that Christian America is on its last leg. The once dominant faith is now facing rapidly declining church attendance, waning political influence, and an abysmal public perception. More than 76% of Americans self-identify as Christians, but many today are ashamed to carry the label. 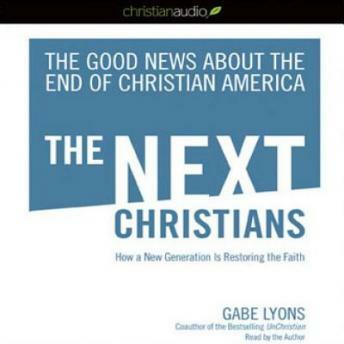 While many Christians are bemoaning their faith’s decline, Gabe Lyons is optimistic that Christianity’s best days are yet to come. In the wake of the stunning research from his bestselling book, unChristian, which revealed the growing disenchantment among young generations for Christians, Lyons has witnessed the beginnings of a new iteration of the faith. Marked by Lyons’ brutal honesty and unvarying generosity, Lyons exposes a whole movement of Christians—Evangelicals, Mainline, Protestants, Orthodox, Pentecostals, and others—who desire to be a force for restoration even as they proclaim the Christian Gospel. They want the label Christian to mean something good, intelligent, authentic, and beautiful. The next generation of Christians, Lyons argues, embodies six revolutionary characteristics: 'When Christians incorporate these characteristics throughout the fabric of their lives, a fresh, yet orthodox way of being Christian springs forth. The death of yesterday becomes the birth of a great tomorrow. The end of an era becomes a beautiful new beginning. In this way, the end of Christian America becomes good news for Christians.' In THE NEXT CHRISTIANS, Lyons disarms readers by speaking as a candid observer rather than cultural crusader. Where other people shout, Lyons speaks in a measured tone offering helpful analysis of our current reality while casting a vision for how to be a Christian in a world disenchanted with the faith. Both a celebration and a reckoning, THE NEXT CHRISTIANS combines current day models and relevant research with stories of a new generation of Christian leaders. If you are worried by what you see transpiring around you, this book will take you on a surprising social exploration in hopes that you too will restore confidence in your faith.